Lighter than most potato soup recipes, this Roasted Potato Leek Soup with Arugula bridges the gap between winter and spring effortlessly. As the weather teases us with hints of warm temps to come, our thoughts turn to spring foods. 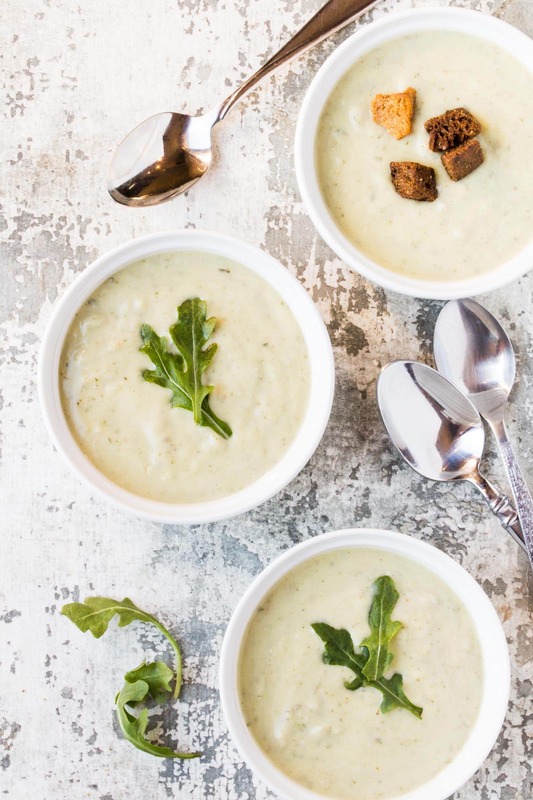 But since our growing season isn’t in lockstep with our cravings, we love recipes like this Roasted Potato Leek Soup with Arugula. Substantial enough to satisfy our hunger yet light enough to not weigh us down, this soup is a welcome addition to your menu planning. Roasted vegetables make this Potato Leek Soup extra flavorful. Typically potato leek soup is made by cooking potatoes in broth and sautéing leeks in pan before combining the ingredients with cream. It’s rich, decadent and always satisfying. The addition of arugula, with its peppery bite, keeps this soup lighter than a lot of other potato soup recipes. All of the veggies – the potatoes, the leeks and even the arugula – are roasted in the oven before being pureed and added to the soup. That extra step caramelizes the veggies and gives them a major flavor boost. 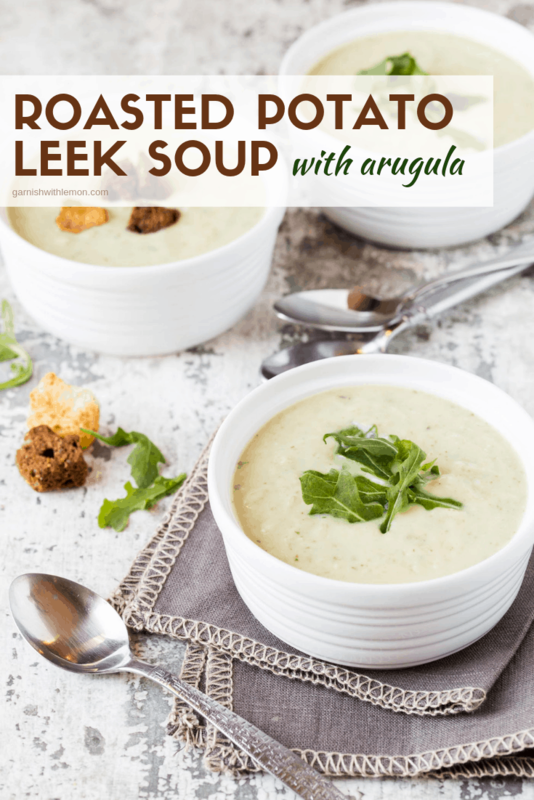 Our Roasted Potato Leek Soup with Arugula is healthier than most Potato Leek Soup recipes. Looking for moderation in your diet? This soup combines a modest amount of half and half with plain Greek yogurt for added protein while still maintaining the creaminess and rich flavor that we all love from Potato Leek Soup. Since leeks are grown in sandy soil, they need a solid cleaning before using them in recipes. All that sand and dirt is trapped in the layers of the leek, and if you don’t thoroughly wash it out, it will find its way into your dish – yuck! For this recipe, start by rinsing whole leeks under water to remove visible dirt. Then cut off the root end and the dark green leaves. Cut the remaining leeks into one-inch chunks. Fill a bowl with cool water and place the cut leeks into the water. Gently agitate the leeks to release the trapped dirt. The leeks will float to the top of the water and the dirt and sand will sink to the bottom. Scoop the cleaned leeks out onto a paper towel and allow to thoroughly dry. Ideally you want to keep the chunks of leeks intact when you roast them rather than pulling the layers apart. They will be less likely to burn if you keep them in bigger chunks. Alternatively, you can peel the layers apart but add them to the baking pan midway through roasting the potatoes. Yes, you can! Make the soup according to the directions, cool completely, pop it in the fridge and simply reheat before serving. Add it to your spring brunch menu as a delicious first course or portion it out into containers to make easy lunches for the week! 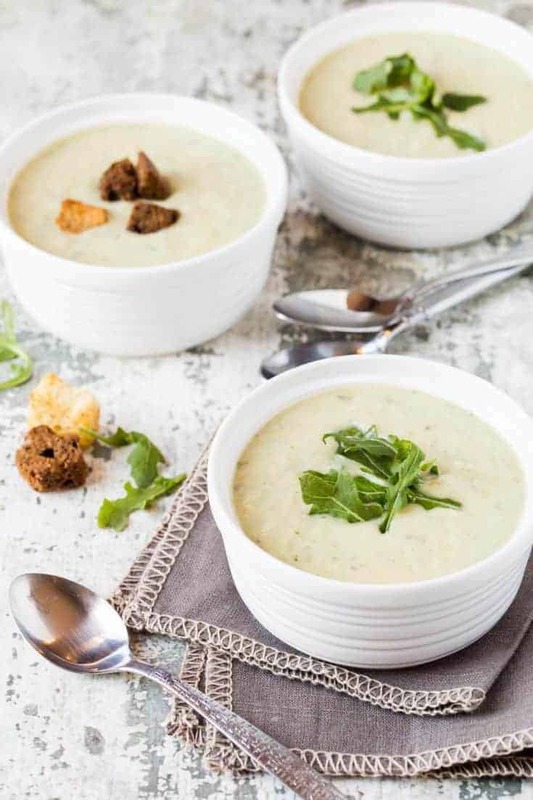 The addition of Greek yogurt makes this Roasted Potato Leek Soup with Arugula healthier than most potato soup recipes but is just as satisfying. Add potatoes, leeks and garlic to a large bowl. Drizzle with olive oil, sprinkle with salt and pepper and gently stir to coat vegetables. Pour vegetables on a sheet pan keeping everything in a single layer. Roast for 40 minutes, turning every 15 minutes with a spatula. Scatter arugula on pan and return to oven for 5 more minutes. The vegetables should be very tender and the arugula will start to wilt. Remove pan from oven and place on heat-proof surface (like the top of the stove). Pour wine on hot pan and scrape bottom of pan to remove brown bits. Working in batches, add 1/4 of roasted vegetables and pan juices and 1 can chicken broth to blender and blend until smooth. Pour mixture into a large soup pot. Repeat until all vegetables are pureed and all chicken broth is used. Gently reheat soup on stovetop using medium low heat. Once soup is warm, whisk in half and half, yogurt and Parmesan cheese. Stir in 1/2 teaspoon salt and 1/4 teaspoon pepper and adjust seasoning as desired. Serve warm with croutons or extra arugula. LOVE that you roasted the veggies first. This soup must be flavour central…and I just want to dive right in, no spoon needed! I love the roasted veg, too. Great flavor! a slow cooker all morning. Do you have any suggestions? Hi Margaret, Ooooh, soup club! I wanna join! I think this would work fine in a slow cooker. I admit I’ve never made it that way, but I suggest making it at home through step three and gently reheating that portion in the slow cooker at work. About an hour before serving, complete step four (whisking in the yogurt, half & half and Parmesan cheese) and let it warm through before serving. Let me know how you like it! I love the addition of arugula, my favorite green! Hope the snow melts soon. What a fantastic flavor combination! Can’t wait to try this! Thanks, Kelly! The roasted vegetables totally make this soup. This soup has my name written all over it. Love the flavors! I agree, Ashley; good ol’ fashioned comfort food! Looks extra creamy and delicious! Pure comfort! Agreed, Pamela. Thanks for stopping by! This really looks amazing. I really love the arugula in there…great idea! Me, too, Monica. Arugula is one of my favorite greens. I’m a big fan of roasted veggies before they go into soups to be pureed, it just adds SO much flavor. LOVE this soup, I need to sneak it in before Spring is officially here! I love potato soup. I am kind of picky about my potato soup as a result. Let me clear that I wouldn’t turn down a bowl of even lack luster potato soup despite having standards. As soon as I read the list of ingredients for your recipe, I was VERY impressed. VERY. Why, thanks, Carol. I hope you enjoy it as much as we do! I say soup season is ALWAYS in season. Love that you used leeks. They are one of my faves and give me hope for spring. So comforting! I love this soup and those homemade croutons finish it off perfectly! Oh this soup looks so delicious and creamy…like the perfect comfort soup! Agreed, Jessica. Comfort in a bowl! This soup looks so delicious that I can’t wait to cook up some for my family. Thank you for the recipe. Hope you and your family enjoys it, Rhoda! This looks wonderful. Any idea if it freezes and reheats well? I haven’t used greek yogurt in cooking much, so I’m not sure. Also – any other veggies you might suggest adding into the roasting process? Ones that are going to be wonderful roasted (the more healthy veggies I can sneak past myself, the better!). Cauliflower seems like a no-brainer, but I’m wondering if others come to mind. Thanks! Hi Beth, Great questions. I haven’t personally frozen this soup. Potato pieces can become grainy when frozen and reheated, but since the potatoes in this soup are pureed, I imagine you wouldn’t have as much of an issue with that. However, the Greek yogurt is not something that would reheat well as it tends to break down under heat. You could substitute creme fraiche if you still want to try freezing. As far as the veggies go, I’d be curious to hear how the roasted cauliflower turns out. I can also see how parsnips might work well, too. Good luck!